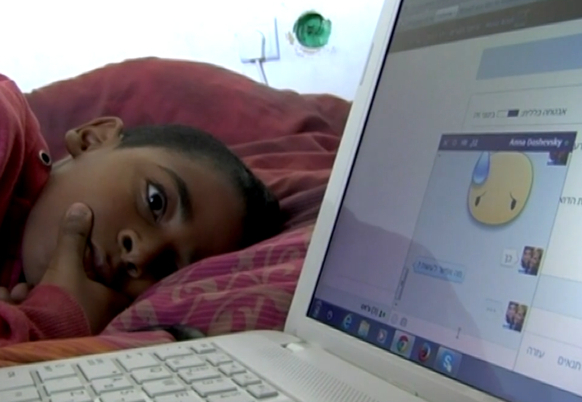 Twelve-year-old Mussa won't speak and no one knows why. He is an African refugee living in Tel Aviv, and for the past five years he's been bussed from his troubled neighborhood to an upscale private school. Moussa's Israeli classmates are his best friends, but he chooses to communicate with them only through gestures. Despite the bond he shares with his friends and teacher, Mussa is alone; his parents struggle to make ends meet and are seldom home, leaving Mussa with his voiceless thoughts and a real fear of being deported back to Ethiopia. Anat Goren was born on 1973 in Israel and lives in Tel Aviv. She is an anchorwoman, director and producer. Goren studied at "Koteret" school of Journalism. 2007: presenter of the TV show "Girls"
"Though the film is relatively short, director Anat Goren packs a lot into it, and captures many candid moments with Mussa, his family, and his many friends. Lots of tears are shed in the movie, and may spill from the viewer, too." "This is an engrossing documentary, pointing the camera at people adjusting to complex issues affecting the life of a child"